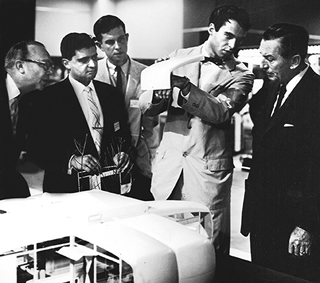 The Monsanto House design team meets with Walt Disney in the mid-1950s to review the scale model and plan: (L-R) Monsanto project manager (unknown); Mike Gigliotti, Monsanto project engineer; Ernest Kirwan, design assistant; Marvin Goody, project architect; Walt Disney. The House of the Future proved an exciting project for a pair of young architects who taught at MIT. Marvin Goody was 33, Richard Hamilton a few years older. That’s not something you can say about every project. Their charge was ambitious—not just to provide a market for plastics in homebuilding, but to do so in a way that was true to the material. Truth to materials is, of course, intrinsic to modernist thinking. “Simply substituting plastic for steel and wood was not enough,” the Associated Press reported. Also in line with modernist thinking was the social goal—to provide a functional family dwelling that could serve as a prototype for affordable plastic homes. 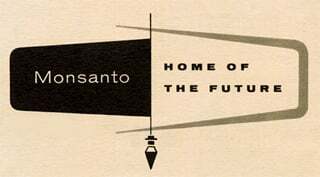 “We hope this house may lead to a mass-produced plastic home,” Monsanto’s plastics division vice president Robert Mueller told the press. Although the project cost $1 million, Monsanto pointed out that 90 percent of that amount paid for three years of research, not for the house itself. 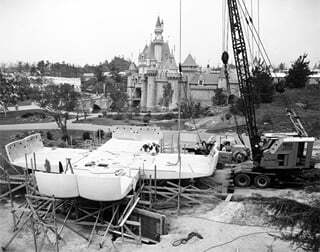 Ernie Kirwan, then a graduate student of architecture in his 20s, came onto the project with dreams of his own. 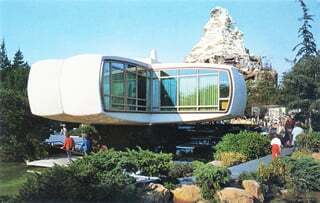 Socially progressive, he believed the House of the Future really was all about designing a prototype house for affordable living. Kirwan admired his boss, Goody—a man of his own height, 6-foot-4, equally rail thin, a nice guy, quiet, almost taciturn, “very well thought of, an influential guy,” and a guy who enjoyed visual flair.